Washington is laying the groundwork to make it harder forCalifornia and other states to slow or stop offshore oil and gas drilling by weakening a decades-old federal law. The law under attack enabled California to halt 36 controversial oil leases in the early 2000s. “Republicans are always supposed to be in favor of states’ rights,” said Richard Charter, of the marine conservation nonprofit Ocean Foundation. “But this is in fact an effort to take away states’ rights when it comes to offshore drilling.” Charter shared that he has never witnessed this level of danger to California’s coastline. The policy would allow new oil and gas drilling in more than a billion acres off the Atlantic, Pacific and Arctic coasts. It includes plans for 47 lease sales over a five-year period. The plan would give the oil and gas industry the first new access to California waters in decades. In response, California and other states passed laws prohibiting new oil and gas pipeline and other infrastructure from being built on state lands — an attempt to make transporting oil prohibitively expensive. While declining to address the concerns of individual states, Interior Department officials said areas included in the initial plan could be reduced in size or removed entirelywhen the final proposal is issued. 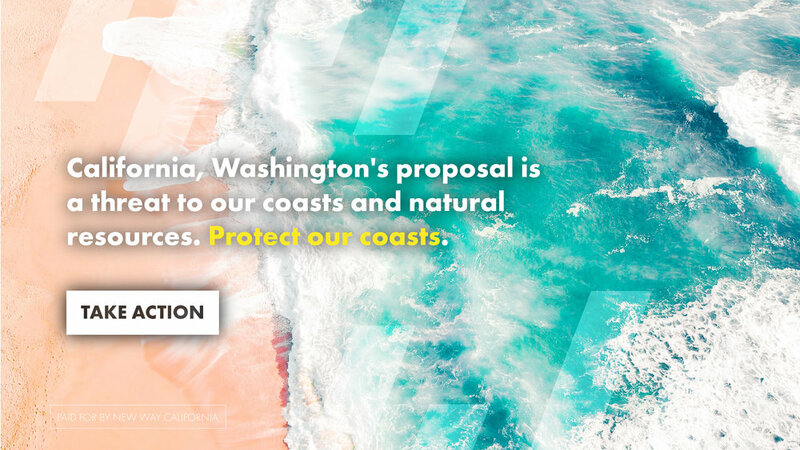 Across the country Republicans have joined Democrats in introducing bills, writing letters and making both public and private appeals asking for an exemption for their coastal states. As Californians, we need to speak out before it's too late. Polls show 69% of residents oppose more drilling and the risk of oil spills is enormous. We will not stand by while our coasts are subject to destructive practices that are a hazard to our health and our environment. Please join New Way California by spreading the message to your family and friends that our coasts are at risk!